With Halloween approaching, I couldn’t let it pass without sharing my coven of Marshmallow Halloween Witches. 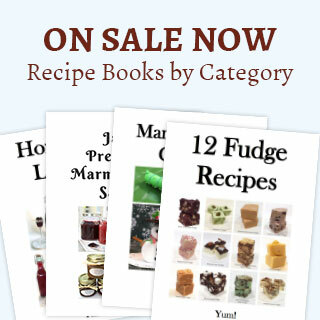 They make great treats for a Halloween themed party, luncheon or dinner. Besides, they were a hoot to make. Step 1: Body – Trim away the top portion of a jumbo marshmallow with your kitchen shears to form a rounded triangular form. Using a toothpick, create a hole on the top of the triangle and then insert a pretzel stick ⅔ of the way into the jumbo marshmallow. 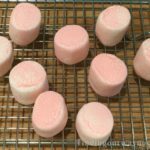 Create a hole in a regular size strawberry marshmallow. Push the pink marshmallow on top of the exposed pretzel tip until the two marshmallows are connected. At the bottom of the body create two large holes for the legs. Step 2: Dress & Face – Roll out the green fondant as thin as you can make it (setting 5 on the pasta machine). Cut the green fondant into wide triangle shapes, enough to cover the front side of the body. Dab a bit of water on one side of the green fondant triangle shape. Carefully place the green fondant piece (dry side out) on the front of the body, pressing firmly to adhere. Step 3: Face & Legs – Holding the body and head for support, create 2 holes in the pink marshmallow head for the eyes then insert 2 black pearls in the holes. Using a mini pink marshmallow cut a small triangle for the nose. Press the point of the little pink marshmallow triangle on the face between the two eyes. Cut the peppermint sticks into 2-inch pieces and firmly push each piece into the two holes for the legs. Place the body upright on a small paper doily for added support. Step 4: Cape & Collar – Roll out the black fondant as thin as you can. Using a small pairing knife, cut a freehand oval shape that’s approximately 4 by 6 inches. Trim a small semi-circle in the middle of the long side of the oval to create an opening for the neck of the cape. Cut a strip of fondant from the fringe edge for the collar. Center the cape from the back of the body and carefully wrap it around the neck, overlapping the green fondant front, then press in and around the bottom to flare it out. Press firmly around the body to ensure the cape adheres to the body. Carefully wrap the collar piece around the neck, overlapping the ends a bit in the front under the head. Pinch off any excess and secure it with a dab of black icing. Add a bit of icing on top and press a large green pearl to resemble a button. 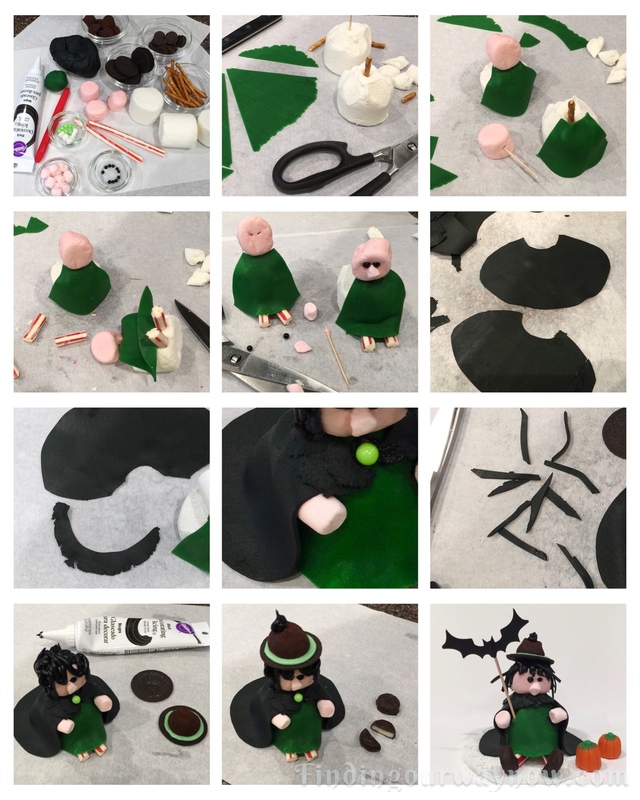 Step 5: Hands & Hair – In the front of the body, tuck two pink mini marshmallows under the cape on the green dress on each side securing it with a dab of water and hold them in place for a minute to help it stick. With a tube of black icing with a small piping tip attached, zigzag the icing up and down around the head finishing with shorter zigzags for the bangs. Cut short, thin strips from the leftover fondant and place them around the head gently pressing them into the black icing to adhere. Add a final dab of icing on top of the head. Step 6: Hat – Carefully separate the Thin Mint Oreo Cookies to reveal the green icing center. Place a chocolate truffle in the center of the green icing, gently pressing down to adhere it to the cookie. Carefully place the hat shape on top of the head, adjust as needed and press down to ensure it sticks. Add a small swirl of icing on top of the witch hat. Notes: It’s important the do each step in the order presented. Trust me; it makes this fun project go much more smoothly. To make a lot at a time, create and cut out all the pieces and shapes first. 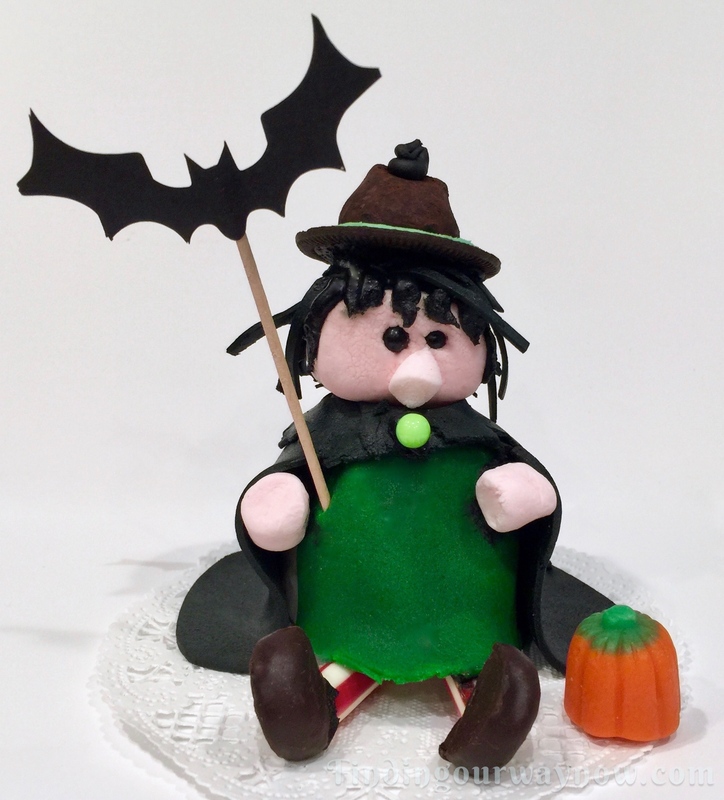 You can create a bunch of Halloween Marshmallow Witches in an assembly fashion. I use pretzel sticks as connectors so that the whole thing is edible and for safety, especially with little children. For ease, I use the cake decorating icing in a tube with a simple small hole piping tip. The doilies help to stabilize the witch’s legs and shoes. They also make it much easier to move the witches from place to place. I find using a pasta maker to roll out the fondant gives it a consistent thickness in a hurry. If you don’t have one of these, you can use a ruler or rolling pin bands. I like using a sheet pan lined with parchment for easier assembly and cleanup. Strawberry marshmallows aren’t the easiest things to find; regular whites will do just fine. Tip: If you can’t find strawberry marshmallows and want the pink color, you can color them with red food coloring and hot water. Fill a small bowl with hot water and add enough red food coloring to achieve a dark red color. Dip the regular size marshmallows in the colored water and roll them around until the marshmallows turn pink. 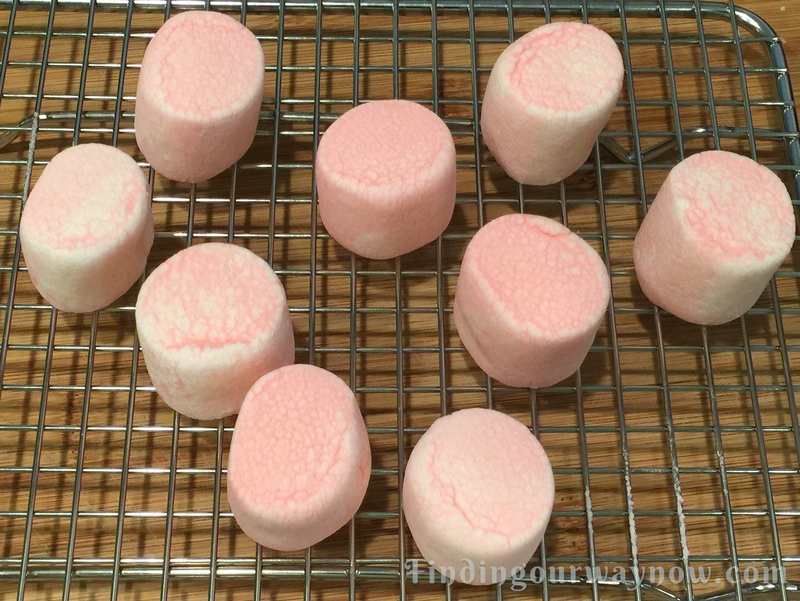 Place the pink wet marshmallows on a drying rack until they have completely dried. This will take some time. I recommend you do this process the day before. These Marshmallow Halloween Witches aren’t hard to make if you take your time. I’ll admit they are more difficult than some of my other marshmallow critters because there are more pieces to assemble. Regardless, they’re still fun to make and share. Now, buy yourself some supplies, break out that sheet pan and pasta maker and give these a whirl. If you enjoyed these Marshmallow Halloween Witches, check out some my other such as these Quick Halloween Treats, Marshmallow Ghosts, Halloween Spiders, Eyeball Pasta, Spooky Spiderweb Deviled Eggs, and Candy Corn Bark.